Sunday's afternoon visit to the park! We had a nice, uneventful trip to UCLA this week to check in with Dr. Woo (pulmonology). There isn’t much to report as her staff is still working on getting authorization from our insurance to schedule the next sleep study…the process seems to be stalled a bit so I’m praying that paperwork will get moving and we get the sleep study on the calendar soon. I’m not optimistic Rudy will pass the study this time but if we can get it done, Dr. Woo might be more open to proceed with decannulation regardless of the outcome. 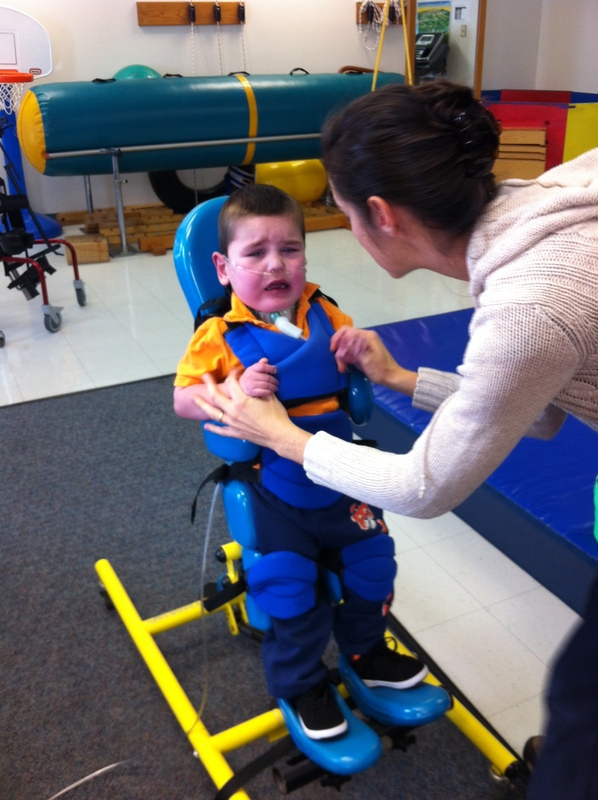 Being new to his team, she is reluctant to give her consent to wean Rudy off the trach without a successful sleep study putting Rudy at potential risk which we appreciate. 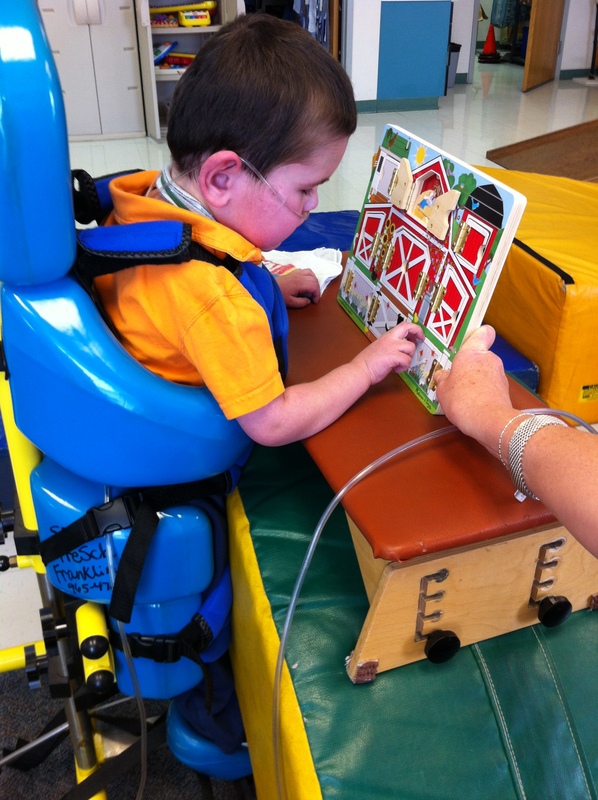 But we also don’t want to wait another year to proceed if he’s not dependent on the trach and simply unable to settle down enough to pass the overnight study (which is our suspicion). While we were on campus, we stopped to check in quickly with Rudy’s surgeon and the staff on duty in the CTICU. We were happy to see Dr. Brian, Dr. Robert, & Nurses Vicky and Kateri but it’s also hard to believe that we’ve been gone so long that many of the faces in the unit Rudy called home for 7 months are new and unfamiliar. We have two more appointments tomorrow with Drs. Kelts (GI) and Corazza (neurology)…both are routine 3 month appts so I don’t expect there will be anything new to report there either. 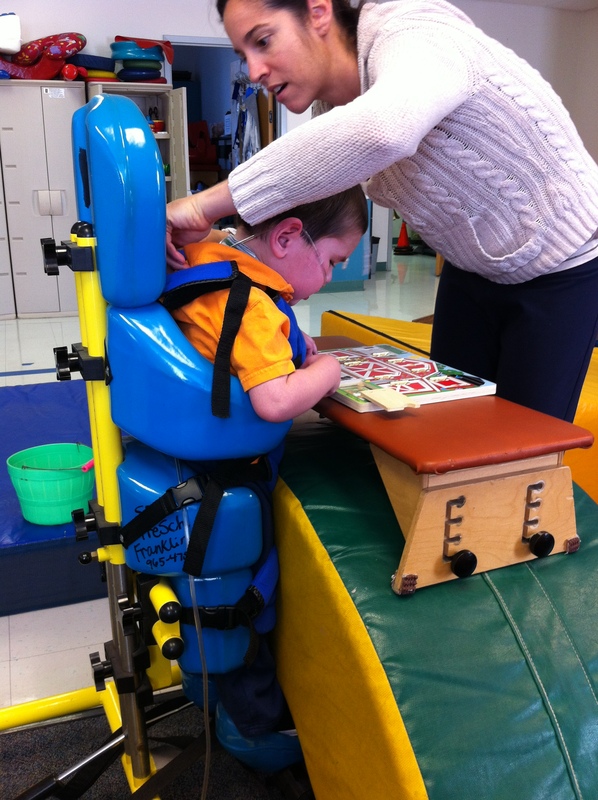 In the midst of all these appointments with his specialists, Rudy keeps plugging away at school and therapy and we continue to see small but significant steps forward. 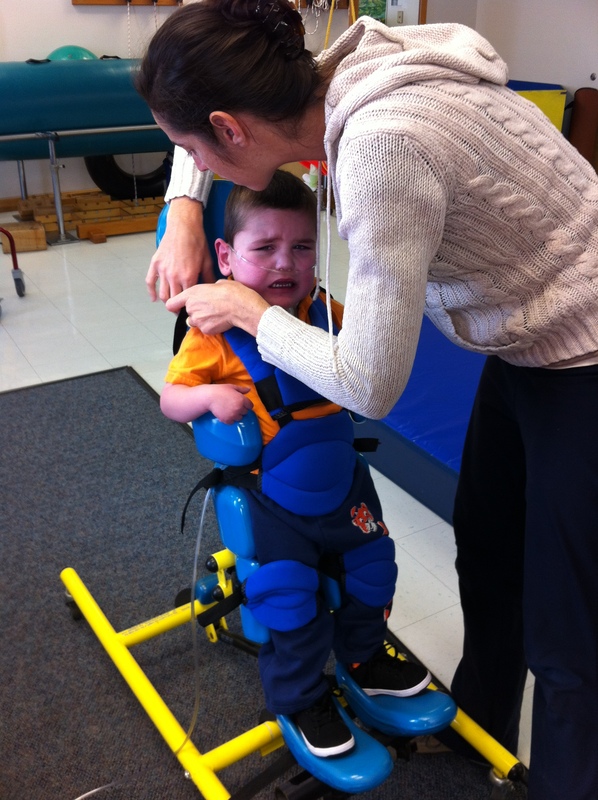 Rudy was fitted today in therapy for a stander…he wasn’t too excited about it at first but was soon distracted by his fun puzzle and stood upright for a little over 30 minutes. It’s a piece of equipment he’ll use at school and possibly something we can use at home periodically. ..."Wha-La"! He's a big standing boy!! On Monday he put food to mouth all by himself for the first time!!! This exciting milestone occurred at Chipotle in Westwood after our appts at UCLA!!! Gee, I wonder what great achievement will happen at tonight’s restaurant of choice? This kitchen remodel seems to be beneficial to Rudy’s oral/food therapy! These “small” steps seem huge to me so I know they bring great joy to you! He’s growing fast and turning into such a big boy, especially with the haircut. Think how his world (and diet) has expanded just because of a remodel. Love you guys. yippie big boy,!!!!!!! chips and ( salsa next time) the real california boy. Do chip taste better with a little bark on them ?? Please, dear Lord. Please don’t let Trish give Rudy food from McDonald’s. Amen. Sounds like great progress to me! Still praying for all of you! Rudy: I will make you your own bowl of gravy. You just let me know! When he’s ready for a double-double – let’s rent out the whole place and invite the ENTIRE CITY to celebrate. These are great big ‘small’ steps, Trish. LOVELY. Lovely. Yea Rudy! I knew you could do it!! With your love of the social scene, eating is a natural extension. Never give up!!! Sorry I missed you as well. I am with Diana, when you rent out In ‘n’ Out I will be there! Love his little voice. Maybe you need to keep that ranch dressing with you and dip the chip in it next time! That is awesome and I can imagine that his very first solid food that he grabs and totally chows down on will be a McDonalds french fry! Amazing how you always have your camera at the ready – thanks for sharing all these little things with us! the In ‘n Out Double Double – now that’s a goal to strive for!! Even if it’s in small bites…….Yum. Glory! Rudy is experiencing one of our greatest pleasures!! Tasting!!! Every blog seems to be a leap and a bound these days!!! Praying for a great sleep study before too long! Love yous! So wonderful to meet you all last night in Santa Barbara! 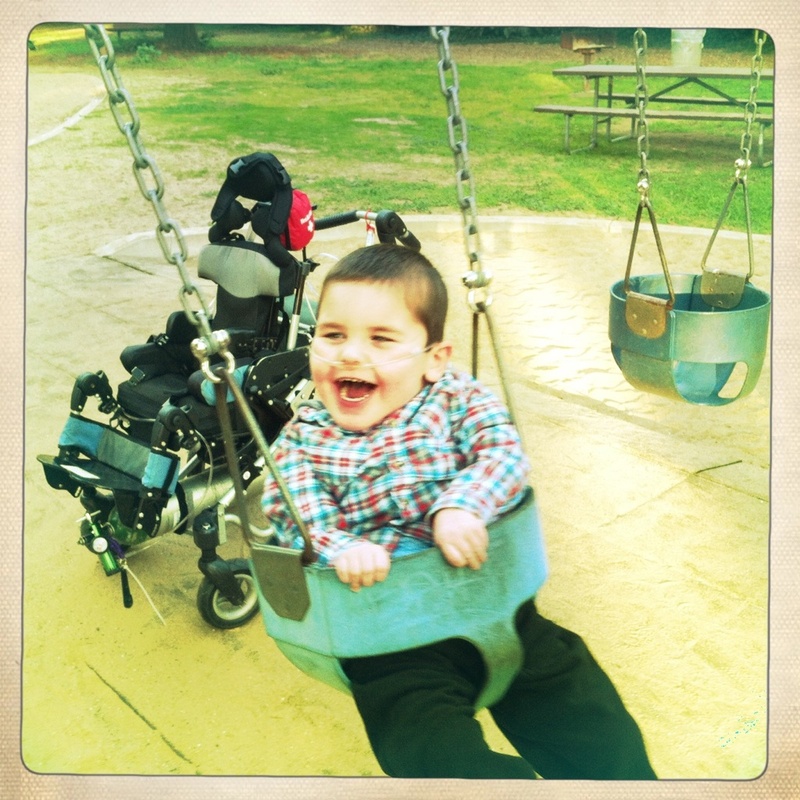 Lucas and Rudy share many of the UCLA docs….Dr. Woo and Dr. Kelts, to name a few. I understand how much you want to get his traech out!! It is such an exciting day when it happens. And it will! However, I recall the sleep studies to be a miserable experience and will pray that all will go forward and successfull with darling Rudy. I hope to post some photos from last night soon. Again it was wonderful to meet you and we look forward to staying in touch and hearing about all the amazing things God will do in Rudy’s life.